Hey! I’m participating in Megan’s second BIBPC. I’m on Team Seagull! For the first challenge, you had to take a picture of something inspired by the prompt little things. Storytime! So, I was trying to come up with something to photograph that was little. I thought of these itty-bitty pink flowers. 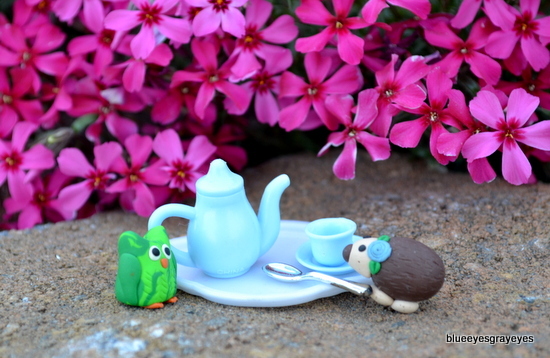 To make my photo more interesting, I added a tiny Barbie tea set and two little clay animals — a hedgehog and an owl (which happens to be a bird, Megan. You said that you could earn an extra point or two if you included a noticeable bird. However, you never said that it had to be a real bird). The clay animals were made by Allison. Aww, thanks so much, Loren! Sea-GULL! Sea-GULL! YAY! Good job, thats sooo cute! Love it! That’s adorable! For a Seagull, that is. so cute!! Go team seagull! (which btw is my new favorite bird :)) Literally. The. cutest. thing. ever.!!!!!!!!!!!!!!!!!!!!! !